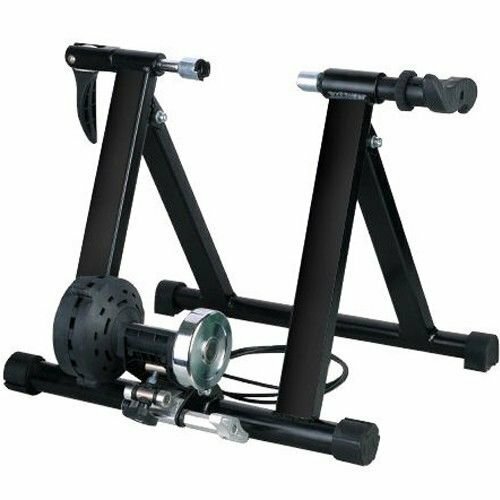 There is no reason why you can not exercise with your bike when the outside weather is bad, this magnetic resistance bike trainer converts your bike into an indoor cycling trainer. It offer effective indoor training in a stiff, well supported steel frame. This Trainer is easy to set up with almost any bike–including road and mountain bikes with a 26″, 27″ or 700c wheel. Fine-tune to your wheel and tire size with the micro-adjust knob. As you pedal the internal magnet creates resistance, with 5 levels of resistance. And you can change them right from your handle bars.